Scenarios are “...an internally consistent view of what the future might turn out to be - not a forecast, but one possible future outcome” (M. Porter, 1985: Competitive Advantage. Free Press, New York). They are thus images of the future that provide a rough and yet consistent illustration of the basic development possibilities for an area – large or small - of interest, and which can therefore be used as a basis for planning. They do not focus on what will happen, but on what might happen. Scenarios have proven to be a particularly beneficial instrument in those areas where developments cannot be forecast, owing either to their high range of uncertainty, their complexity, their susceptibility to interference, or their dependence on human decisions. The water sector is such a complex system, interconnecting natural, technical, political and social components. Within the LiWa project, scenarios are developed to build a range of possible futures in the water sector in Lima by the year 2040. 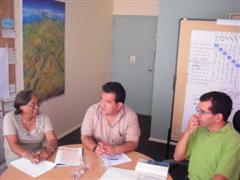 In addition, scenario building is also used to promote participation and communication between stakeholders in Lima, i.e. representatives of the local water utility, public authorities, civil society and scientists. The inclusion of different viewpoints helps the scenario building process in defining assumptions and driving forces and assessing interdependences. 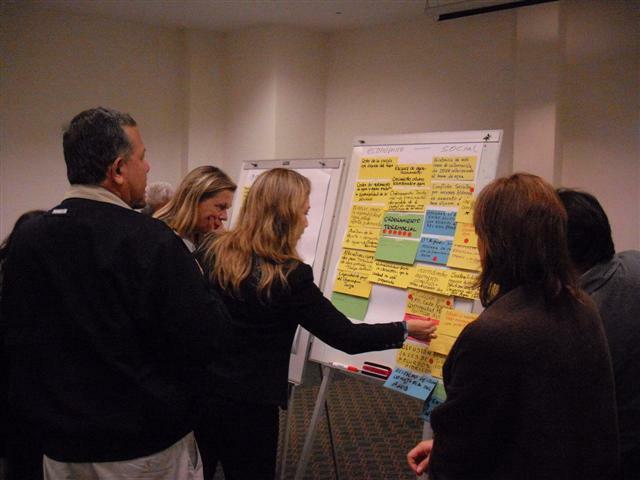 In several local workshops in Lima, moderated by the ZIRIUS project team of the University of Stuttgart, the main factors (or driving forces or descriptors) that influence the water sector by the year 2040 were identified and some potential developments in the future were formulated. The final scenarios are some consistent combinations of the descriptors and their sub-scenarios. To ensure internal consistency of the scenarios, the LiWa project uses the cross-impact balance analysis (CIB) to generate scenarios. CIB includes the systematic evaluation of factor interdependencies using a qualitative concept of cross-impact judgements. The water supply of Lima and Callao, in the year 2040, is under pressure due to the population growth, the city’s horizontal and vertical enlargement, the difficult socio-economic situation, the deficits in water infrastructure and especially because of weak governance structures. This pressure grew progressively due to climate change effects during the last years, independently of the direction of the last one, either with clearly diminishing or increasing rainfall in the upper watershed. Scenario B is very similar to Scenario A. The urban population increased during the last decades, the city continued the same tendency growing horizontal and vertically and with the dynamic of occupying the valleys. Even though the governance structures are very insufficient as in Scenario A, this scenario may count on some actors taking initiative, acting with the objective of improving the water system of the city and ensuring the water supply of Lima and Callao. In the variation B1 the management of the river watersheds comes out to work integrating different institutions in a participative way. In the variation B2 a private water company tried improving the overall situation of water supply. In both cases the actors act isolated and their measures are limited to certain areas of the water system. In Scenario C the isolated acting actors of the mesoscale (meaning the level situated between central government and local entities) in the Scenario B (the integrated river watershed management and the private water company) are to be found together and working in a concerted way. Even though the population grew during the last decades and the city is maintaining its expansion tendency in a horizontal and vertical way; and also taking into account that Lima and Callao are suffering a serious climate stress and that general political and socio economic conditions are not more promising than in the Scenarios A and B, the concerted work of these two actors could achieve better results for Lima and Callao’s water sector than the simple sum of their isolated activities. The water supply of Lima and Callao in 2040 is relatively independent from climate change effects, thanks to strong governance structures on all levels (local, regional and national), that fostered the coordination, concertation and long-term planning as key actions. Also because public policies which benefit inclusion, employment and are oriented towards poverty alleviation have been developed and promoted in the last decades. The city counts with a coordinated municipal development plan that incorporates adaptation strategies for the city favoring stable socioeconomic conditions and consolidated water infrastructure. During the second phase of the LiWa project, the scenarios underwent a further review procedure in Round Table discussions with the main stakeholders of the water sector. The next step was to combine the qualitative CIB scenarios with the modelling software "LiWatool" to simulate the scenarios till the year 2040 ("CIB and simulation"). 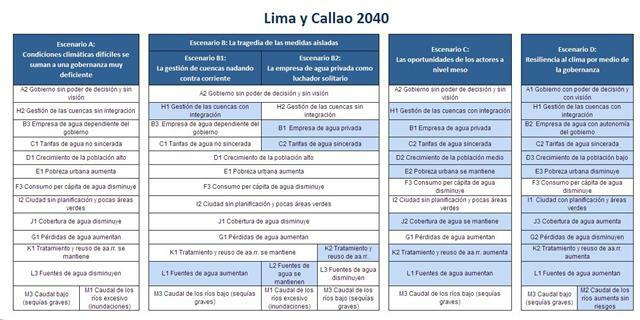 The scenarios also provided a general framework in the LiWa project for evaluating the possible performance of different measures to improve the future water supply of Lima and Callao and to come to an agreement for an "Action Plan" ( pdf file). The aim of the combination of qualitative scenario analysis CIB with the numerical and quantified simulation was first to use the scenarios as input parameters for the modelling software “LiWatool” and to simulate the scenarios till the year 2040. Second, the output parameters calculated by “LiWatool” were used to evaluate the performance of the different scenarios with regard to different evaluation criteria in a quantitative way. The methodology used builds on the classical “Story-and-Simulation”(SAS) approach, but tests the new methodology “CIB and simulation”. Results of scenario storylines and simulation were combined into integrated scenarios, containing narrative and numerical parts. These integrated scenarios are documented within a 55 page report ("Escenarios para el futuro - Lima y Callao 2040. Escenarios CIB, storylines & simulación LiWatool"). This document was officially launched during the LiWa Conference in Lima on April 16th, 2013.